Banana bread is a classic comfort dog treat. 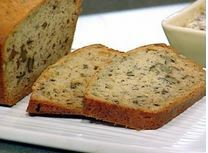 The pieces of bread are really delicious and soft, laced with the faint aroma. This recipe is generally traditionally, but they differ in some ways. We only use natural sugars such as bananas, applesauce and honey, is much more to dog’s taste. I don’t recommend to use nuts which are rich in fat which can cause gastrointestinal problems for dogs. For the same reason, we choose the low fat milk. Whole-wheat flour contains the bran and the germ, is rich in fiber and vitamins. If you have some over-ripened bananas, you can freeze them for use in banana bread and other baked goods. You can store the whole bananas in the fridge, or you can mash them and store. 1. Combine the wheat flour, baking powder and cinnamon in a large mixing bowl, stir to blend. Lightly beat the egg. Whisk together the egg, mashed ripe bananas, honey, applesauce and milk in a small bowl until well blended. 2. Stir banana mixture into flour mixture until combined. 3. Preheat oven to 350°F. Lightly grease a 9×5 inch loaf pan. Place dough in the greased bowl, and turn once. 4. Bake at 350 degrees F for 50 minutes until a bamboo skewer inserted in the center comes out clean. 5. Release the bread from the pan and cool on a wire rack.